Protects against mess, dirt, spillages and staining, etc. whilst painting and decorating, plastering, tiling and general building and maintenance projects. Protects against costly damage to most surfaces. Easy application, simply unwind and cover-it. Waterproof – good against paint and liquid spillages. Safer to use than loose dust sheets and covers as it adheres to the surface. Can be left down for up to 4 weeks. In areas of heavy traffic, e.g. doorways, repeat application may be required. Cover-It can be applied over itself provided the surface is free from dust, moisture and grease. 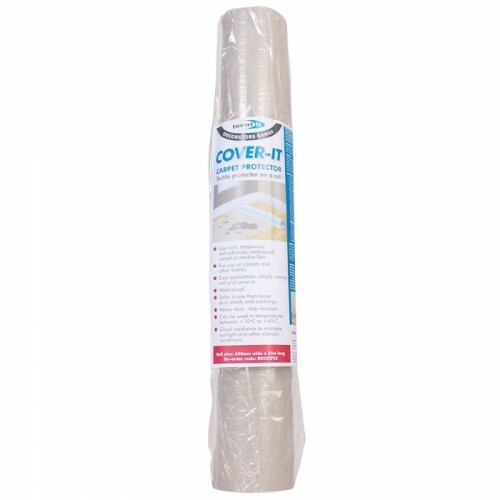 Easy to apply simply roll onto the floor or surface and adhere it firmly to the material to be covered. To remove:- the low tack adhesive will allow for easy removal. Lift each edge in turn and pull back ensuring any spills are covered and cannot escape before lifting the whole sheet.